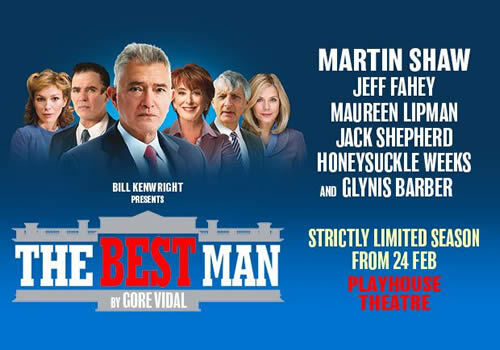 Martin Shaw stars in Bill Kenwright’s production of Gore Vidal’s political play The Best Man, running for a strictly limited season at the Playhouse Theatre. After a hugely successful UK tour, the sharp drama makes its West End premiere at the London venue, at a time when American politics are a hot topic of discussion. Originally written and produced for Broadway over 60 years ago, The Best Man follows US presidential candidate William Russell, an esteemed ex-Secretary of State with a bit of a dodgy reputation. Running neck and neck with ambitious newcomer Joseph Cantwell, Russell’s only hope of winning is to get endorsed by a respected ex-President and party big-wig. But how far will they each go to achieve their goal? Martin Shaw stars as William Russell, opposite Jeff Fahey as Joseph Cantwell. Shaw is best-known for his television roles in Judge John Deed and Inspector George Gently, whilst Fahey recently starred in Twelve Angry Men opposite Shaw. Further cast members include Olivier Award-winner Maureen Lipman, Jack Shepherd, Glynis Barber and Honeysuckle Weeks. The Best Man is directed by Simon Evans, with design by Michael Taylor and lighting design by Chris Davey, with sound and compositions by Ed Lewis. A sizzling political drama that is all-too pertinent in the current social climate, the play mirrors the surprising results of campaigns and the fights that they entail. Playing a strictly limited season at London’s Playhouse Theatre, The Best Man runs from February 24th to May 26th 2018, with an official opening on March 5th 2018. The Best Man may not be suitable for young children.